Simplifies paths on navmesh graphs using the funnel algorithm. The funnel algorithm is an algorithm which can, given a path corridor with nodes in the path where the nodes have an area, like triangles, it can find the shortest path inside it. This makes paths on navmeshes look much cleaner and smoother. The funnel modifier also works on grid graphs however since it only simplifies the paths within the nodes which the original path visited it may not always simplify the path as much as you would like it to. The RaycastModifier can be a better fit for grid graphs. Insert a vertex every time the path crosses a portal instead of only at the corners of the path. The resulting path will have exactly one vertex per portal if this is enabled. This may introduce vertices with the same position in the output (esp. in corners where many portals meet). Determines if twists and bends should be straightened out before running the funnel algorithm. If the unwrap option is disabled the funnel will simply be projected onto the XZ plane. If the unwrap option is enabled then the funnel may be oriented arbitrarily and may have twists and bends. This makes it possible to support the funnel algorithm in XY space as well as in more complicated cases, such as on curved worlds. This has a performance overhead, so if you do not need it you can disable it to improve performance. 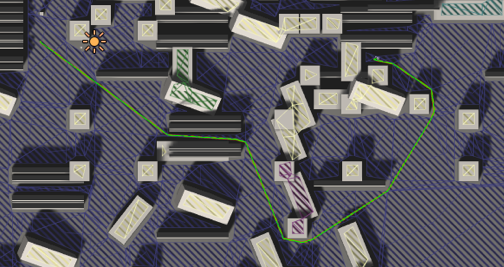 Pathfinding.Funnel.Unwrap for more example images. This is required if you want to use the funnel modifier for 2D games (i.e in the XY plane).